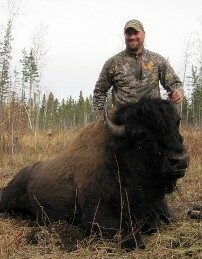 Pound for pound the largest mammal hunted in Alberta, get ready for a 7 Day Snowmobile Adventure hunt for wild Buffalo! In the area west of Wood Buffalo National Park, small herds of Wild Buffalo (Bison) have ranged for many years, establishing a huntable population outside the park. These small bands inhabit the Caribou Mountain plateau and its southern slopes in WMU 534. These are a hybrid species after an introduction of plains Bison in the 1920’s, and are permitted for export to the USA. We hunt the Buffalo during the fall moose season, and then as a dedicated hunt during the winter months on snowmobile from a mobile cabin. With the ground and creeks frozen, we can access distant areas impossible to reach in the warmer season. The winter days are short in Alberta, but we make efficient use of the daylight hours, covering many miles of trails on the machines to come up on a herd with a trophy bull. This hunt will test your resolve as weather is harsh and snowmobiling 70 miles a day may take its toll, but success is never sweeter than served with adversity! Timber Wolf are regularly seen in the area, and included on your hunt with no trophy fee. Save a buffalo and shoot a wolf!